A glum goth poseur Leonardo. Fun, right? What do teenagers do? Eat pizza? Certainly. Say the word “cowabunga” without irony? Not as often as they once did. Fight evildoers with their ninja skills? Highly unlikely. Monopolize the bathroom for hours on end? Bingo. That appears to be the thinking behind “Teenage Teenage Teenage Turtles,” Dorkly’s retro-styled, 8-bit animated parody of Teenage Mutant Ninja Turtles in which the famed quartet of “heroes in a half-shell” display the emotional and physical traits most commonly associated with those in their age bracket. 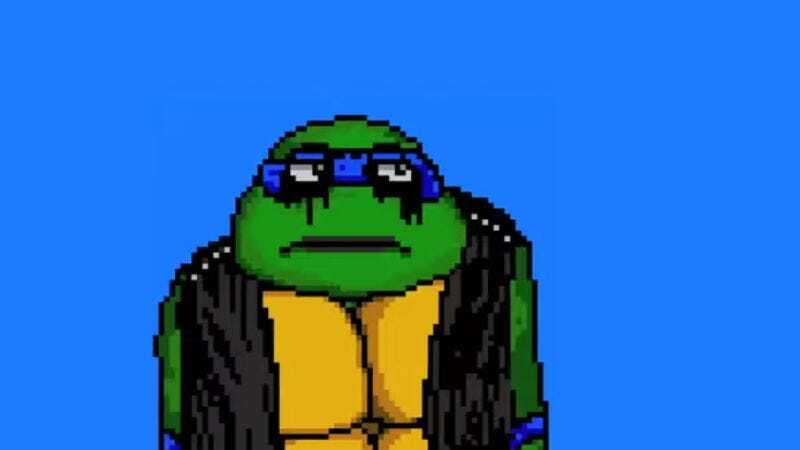 Raphael, for instance, seems to have a nasty case of acne from his steady diet of junk food, while a giggly Donatello razzes the overly-sensitive goth poseur Leonardo for “trying to make turtle soup,” which is the crew’s peculiar euphemism for masturbation. Meanwhile, the team’s mentor, Splinter, is caught in the thankless role of “single dad trying to be cool”and arouses the ire of his charges by introducing them to his new live-in girlfriend, Linda, whom he met online. This is all rather disillusioning for those who grew up with the franchise, but the vintage video game look of the clip should help ease some of the discomfort.